3 is the number of witches in William Shakespeare’s Macbeth. 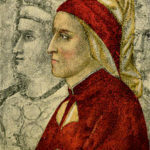 Dante Alighieri’s Divine Comedy has three parts each of thirty-three cantos (plus one introductory canto totaling 100). It was written in terza rima, a combination of tercets. All of this is an allusion to the Christian Trinity. The number three recurs several times in Tolkien’s The Lord of the Rings and also in The Silmarillion. Three Rings of Power were given to the Elves. There are three Silmarils. The unions of the Eldar (Elves) and the Edain (Men) were three in number: Beren and Lúthien, Tuor and Idril, and Aragorn and Arwen. Three Blind Mice is a children’s nursery rhyme and musical round. The Three Musketeers is a novel by Alexandre Dumas, and is part of a trilogy. The Three Little Pigs – children’s classic literature. 3 is the number of wishes normally granted in most fairy tales and stories. Likewise, the protagonist in most stories faces 3 conflicts, whether mental or physical before his or her great triumph. Download the 419-page PDF document here [14.5 Mb].